I love the idea of giving new life to an old item and have been an avid painter over the years. I discovered chalk paint last summer and went to town chalk painting anything and everything I could get my hands onto. Before that I used regular paint to revamp old furniture. I’ve also been one to do a quick recover on dining chairs to freshen them up. I love giving a personal, unique touch to an item and the amount you can save doing some work is great. Plus, you can’t beat having a real wood product over the cheap materials that are being used today. Here are a few of my bigger projects from over the years. When we were building our house we designed a dining room cantilever that was to be five feet in length. Last minute changes to our floor plan once our home was in the building stage resulted in us having to change the size of the cantilever to be only four feet long. Turns out, it isn’t that easy to find an appropriate piece of furniture to fit that small of a space that still provides the right height. 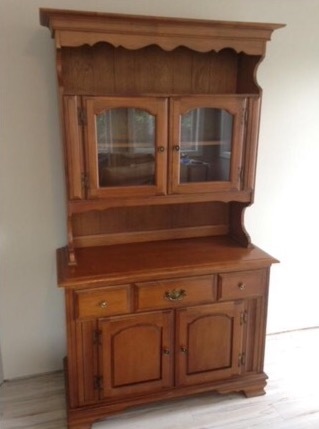 I eventually turned my search to Kijiji and came across this piece. I loved the detailing of it; the beadboard backing, the scroll design and the groove details on the doors. I knew that these details would pop once it was given a paint job. I used Van Gogh white chalk paint for this piece but didn’t scuff it up, instead keeping it a pure white. I also used a roller instead of a brush as is typically suggested with chalk paint to give it a smoother finish. Not going to lie, it was a time consuming project and the feelings of nausea and tiredness that came with early pregnancy didn’t help get the job done quickly. Now that those memories are in the distant past and it is finally finished, I am super happy with how it turned out! 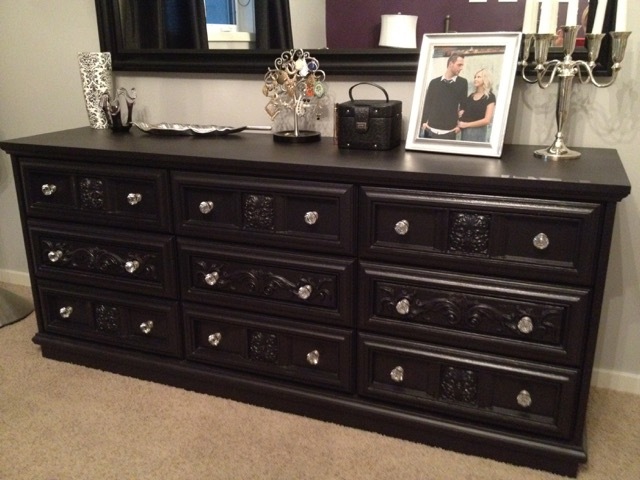 This project was a dresser I completed for our first home. It was my parent’s dresser from their original bedroom suite set which was purchased in 1975. It was made in Canada of real wood and was a super, sturdy item. I couldn’t get over the beautiful detailing on the drawers. I sanded the dresser first, used one coat of primer, two coats of Behr black paint and switched out the knobs to add a touch of glamour to it which matched the rest of our old home’s decor. I also painted the matching dressers. 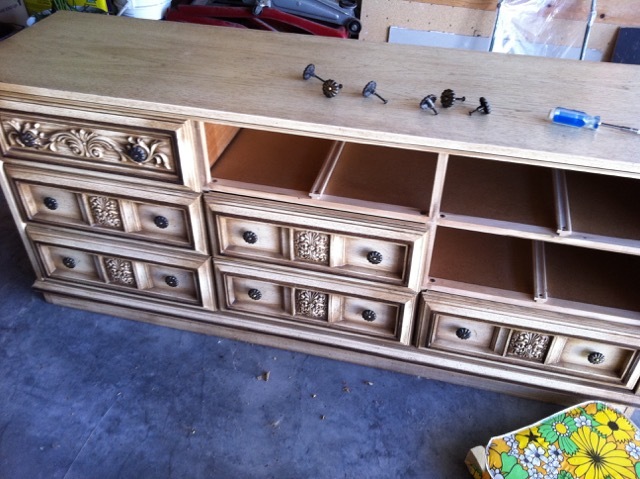 The knobs weren’t the cheapest but overall the cost was minimal compared to purchasing a new item made of real wood! When searching for the right nursery chair for Emsley’s nursery I came up emptied handed. Everything I was drawn to was visually appealing but was not the most comfortable, which I’ll admit normally doesn’t stop me from buying something. But, in this case I knew that this chair needed to be comfortable for late night soothing and before bed cuddles and story time. It also turns out that the price for rockers are not cheap! It seemed that most nowadays would rock or glide, but not recline which I also wanted as an option. Some stores did offer a matching ottoman to purchase separately for what seemed like a high extra cost but I knew I wanted a pouf for later use when Emsley was older and didn’t see the need for an ottoman to use for such a short time. My mom then suggested that I stop looking at retail stores and online and instead turn my search to her basement. Turns out she still owned her original rocker/recliner chair that she had purchased for my brother’s nursery and later used with me. When I laid eyes on it I knew it would work perfectly in our nursery. Not only did it have great bones but also the pintuck detailing fit in perfectly with our home decor. 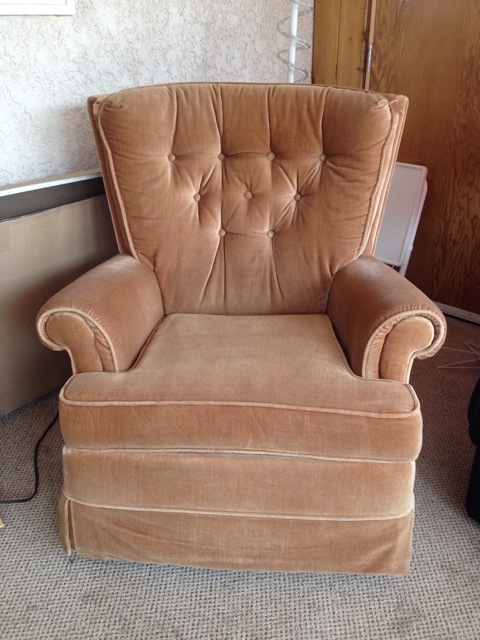 I contacted a local guy to get pricing and decided to have it reupholstered for Emsley’s nursery. I picked a material from him that would wash easily and wasn’t too light in colour as I knew unknown substances and lots of spit up would likely end up on it. 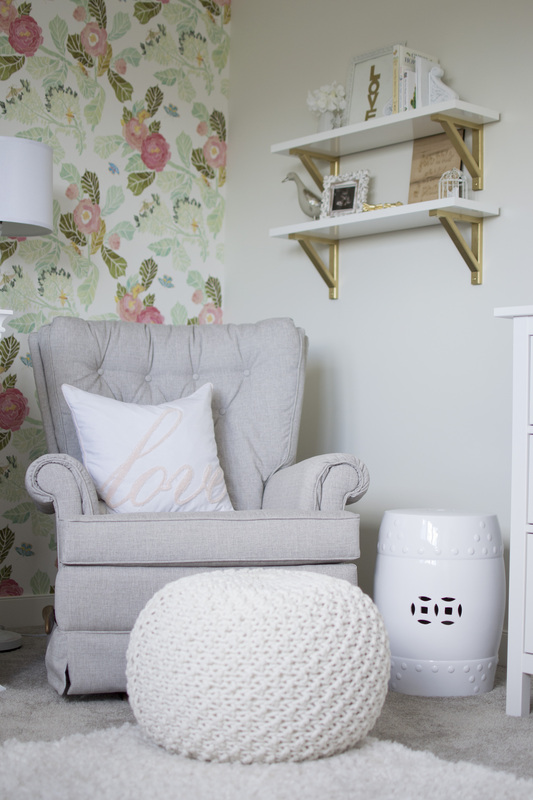 At first, I picked out a beige colour that tied in beautifully with Emsley’s nursery but then made a last minute change to a grey/beige colour that would work better with grey tones with the idea that it could be used for future nurseries. I also figured the neutral colouring would fit in perfectly with the rest of our house decor for when the time comes that it no longer needs to be kept in a child’s bedroom and can be easily transitioned into our basement or master bedroom. Sometimes the DIY task is just too much to handle and recovering this myself would clearly have been impossible. I am so happy I decided to have this done as not only is it a great piece of furniture which ended up costing me about half the amount of purchasing new, but it also has sentiment attached to it which makes it even more special. I hope this post inspires you to get going on that DIY project that you have been putting off for a while. If you’re like most people, you have already bought that loved item, have all the visions in your head and went out to purchase all the necessary supplies. Yet, all that stuff is collecting dust somewhere in a pile taking up space in your basement or garage. Even though the cooler weather is upon us, you can still do mini projects in a warm basement. The best thing about chalk paint is that it does not require any sanding before applying and barely has any smell so it’s easily something you can do indoors during winter! Love this post! I agree, it’s nice to give new life to something old…and I usually feel so proud to show it off too 🙂 Was wondering where you called to get your chair recovered…I have a couple of arm chairs that could use a refresh. Keep up the beautiful work and inspiration! Hi! Thanks for the message! I used a place called Peckham Upholstery in La Salle, MB. He wasn’t the fastest at getting it done but the quality of the work was amazing. His prices also seemed to be the best, based on what I found. Hope that helps! Good luck with your chairs! Hi there, love your home decor! 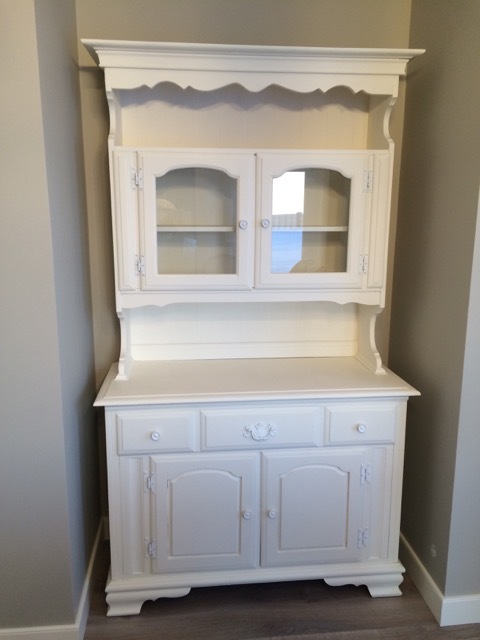 I have a piece of furniture similar to that one you painted white and I’m interested in doing the same. Are you still happy with it? Does the chalk paint on the knobs or door hinges get scratched or faded?